Nancy Shevell and Paul McCartney celebrated their marriage again at Bowery Hotel. Home Entertainment Nancy Shevell and Paul McCartney celebrated their marriage again at Bowery Hotel. Nancy Shevell and Paul McCartney celebrated their marriage again at the Bowery Hotel in New York City last night. Nancy Shevell, 51, and Paul McCartney, 69, celebrated again their marriage with some of the biggest names in the music industry. 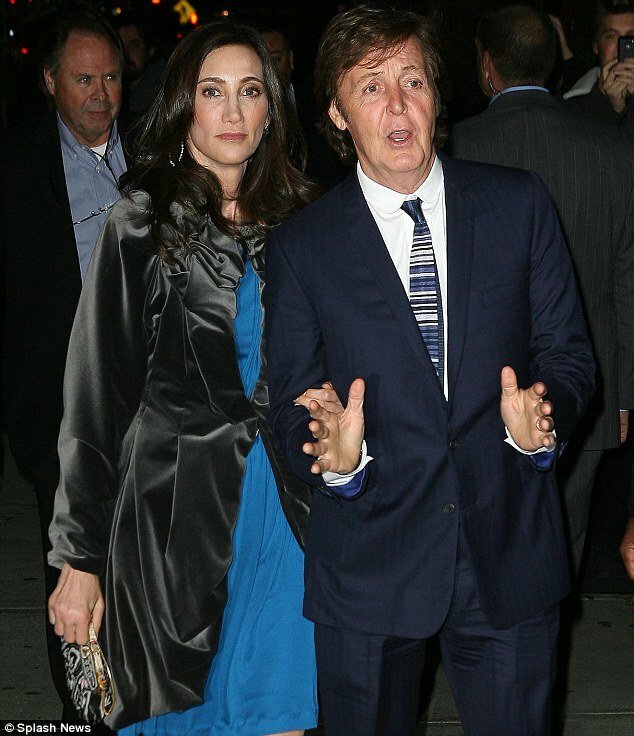 Nancy Shevell wore an electric blue dress and satin jacket paired as she tucked her arm through Sir Paul McCartney. Lady McCartney accessorized with a black and white clutch, strappy black heels and her giant Cartier engagement ring. Paul McCartney and Nancy Shevell previously partied into the wee hours of the morning following their October 9 wedding at Paul’s home in London. Sir Paul matched his outfit to Nancy Shevell’s, looking dapper in a navy blue suit, blue and white striped tie and white shirt, looking his normal animated self as he arrived at the event. Nancy Shevell and Paul McCartney were joined by a slew of famous friends including Yoko Ono, widow of late Beatle John Lennon, and their son Sean. Yoko Ono and Sean arrived in hats with mother sporting a black top hat and son in a maroon number and matching bow tie. Smiley Rolling Stone Keith Richards arrived later joined by his wife Patti Hansen who wore a clinging black dress and black jacket. Keith Richards wore his usual red headscarf under a grey hat which he tipped to onlookers outside the party. Nancy Shevell married Paul McCartney on October 9 at Marylebone Register Office in central London, where he married Linda Eastman in March 1969. The 51-year-old American millionairess is the third wife of Sir Paul McCartney. Nancy Shevell started dating the former Beatle in November 2007 and it was announced on 6 May 2011 that the two had become engaged. Nancy Shevell and Paul McCartney have a combined fortune of over $1 billion. Zurana Horton, pregnant woman shot in front of a Brownsville school while defending her children. Halloween 2011: top 12 most popular costumes.